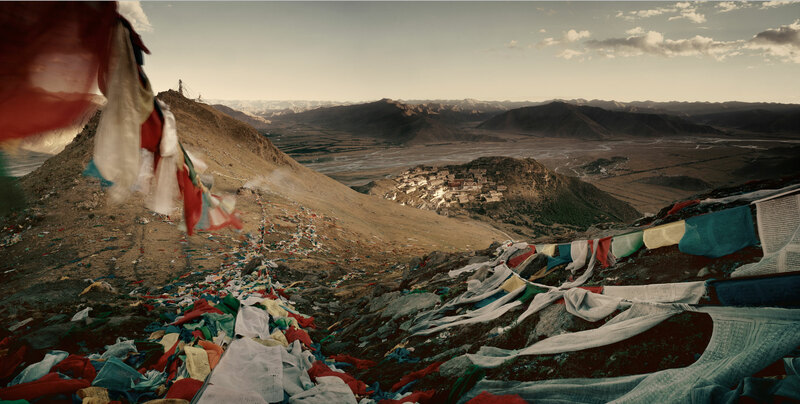 The Tibetan plateau is a beauteous landscape of hidden treasures and riches. Steeped in magic and mystery, this wondrous forbidden land contains within its fold a mass of remarkable people. There is timeless romance in the way of life of Tibet’s travelling tribesmen who celebrate their unique heritage through elaborate costumes and ornaments. The designs are replete with the cloud motif as homage to the mountainous regions they inhabit and a tribute to age-old Buddhist traditions. The most striking feature of their traditional garb is the large variety of materials used, such as brocade, fur, leather, silk, wool, cotton, among others. The design also varies significantly depending on the wearer’s location and occupation. For instance, among the Lhoba tribe inhabiting South-Eastern Tibet, the men wear knee-length black jackets without sleeves and buttons made out of sheep’s wool, alongwith helmet-like hats that are made from bearskin or woven from bamboo stripes. They also wear ornaments such as earrings, necklaces made of beads, and bamboo plugs inserted into the ear lobe. The women wear narrow-sleeved blouses and skirts of sheep’s wool and the weight of the ornaments worn by womenfolk is regarded as a symbol of their wealth. It includes shells, silver coins, bells iron chains, silver and brass earrings. Tibetan Tribal Jewelry is typically made of high-grade silver crafted with ornate and profuse symbolic representations in distinct colors inspired by nature. Amber, Turquoise, and Coral are the most commonly used stones, while commonly found white conch shell also finds its way on jewelry. Gold is applied only sparingly, usually as delicate gilding, if at all. The pieces worn by tribes are often multi-purpose and used interchangeably – a jewelry piece worn as a necklace at one time can become a headpiece for another occasion. A pendant might find itself on a necklace, woven into the hair, pinned on clothing or hung from a belt around the waist. At certain times, an amulet container or prayer box, referred to as ‘Gau’, is also worn as a piece of jewelry. The habits, history, beliefs, climate and character of the indigenous tribes of Tibet shine through each article of clothing and accessory worn by them. It rests upon the world to be inspired by their creations and preserve the beauty inherent in the work of these nomadic craftsmen. Posted in Jewelry, Tibet, Travel, Tribes and tagged Brass, Buddhism, Costumes, Jewelry, ornaments, People, Silver, silver coins, South-Eastern Tibet, Tibet, Tibetan plateau, Travel, Tribes. Bookmark the permalink. Yes Bijit, Taken by some great photographers. A journey to the Tribes of Tibet. Their clothing and accessories purposes. A lovely article to read and learn..